In this fast-paced digital world, things can change in the blink of an eye. Dream and Friends would like to share with you these recent updates to our late-breaking coverage. This is news you need, when you need it. When I theorized that the “original edition” of Donkey Kong bundled with European Wii consoles was an unreleased prototype game, I was making an assumption based on the likeliest case among a series of unlikely scenarios. I was wrong. Donkey Kong’s reality is, somehow, even stranger than what I’d suggested. Guys, I don’t think this is a prototype at all, but an official Nintendo ROM hack. The first half of the PRG ROM contains all the new data for the cement factory level, a copy of the title screen with the updated 2010 copyright, and a lot of code patches. The second half is identical to the US PRG1 ROM, except various routines have been hijacked to point to the new patches. A lot of them do really hackish things, like manually copying the entire sprite data page to unused RAM and shuffling it around (so the cement pies don’t disappear), checking Mario’s current animation frame to see if he’s climbing (for the moving ladders? ), and shoehorning in new data if the current level number is 02. It’s also coded pretty sloppily in places, jumping to the same subroutine 5 times in a row, for example. This might explain why it glitches occasionally. A true prototype would have certainly been built on the original source code, as Mario Bros. Classic was, not split into a bunch of patches. Whoever did this either didn’t have access to the original source, or no longer had the necessary tools/knowledge to compile it. 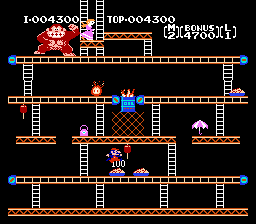 I had assumed that Donkey Kong: Original Edition was an unreleased special version coded during the NES’s lifespan. And yet we have proof here of something even more unlikely — Nintendo apparently still employs the rare breed of individual who is familiar with the inner workings of a console that hasn’t seen a new first-party release in 15 years. Let us never doubt Nintendo’s power ever again. Another unexpected discovery was made during Wizard Week — specifically, the mid-week break in which I focused on a series of strategy guides published by Bantam Books. Doing some Internet sleuthing, readers Madeline Henry and Michael Stearns identified the cover artist as Bill Mayer. 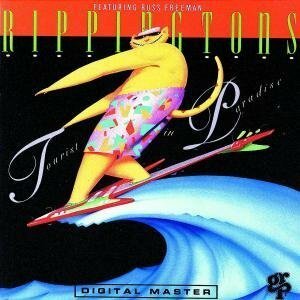 The surfing cat featured in “Ultimate Unauthorized Nintendo Game Boy Strategies” is actually the mascot for the smooth jazz outfit The Rippingtons — he appears on several album covers, and even stars in one of their videos! These books have been in my collection since I was a kid, and finding out more about them after all these years was a real treat. Thanks for the comments, guys! Finally, Kotaku picked up on the iPhone smash hit My Virtual Girlfriend a full eight months after I’d originally featured it here. Somehow, the fabric of time itself was altered so that the game could be released “just in time for Valentine’s Day” in the year 2011. This serves as an important reminder to always trust Dream and Friends as your first-on-the-scene source for video game news that matters. This entry was posted on Saturday, March 5th, 2011 at 4:01 pm and is filed under NES, Potpourri, Scandalous Strategies. You can follow any responses to this entry through the RSS 2.0 feed. You can leave a response, or trackback from your own site. I enjoy seeing innovative content such as this with top quality information compiled and talked about. I think if you dug even a tiny bit further, this actual post could nearly end up being a great academic post or useful academic resource. I have added your blog to my RSS reader to watch what you have in the near future.